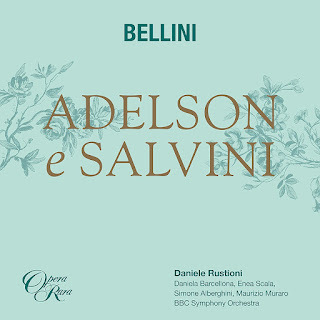 Because Bellini wrote so few operas, his early ones take on a greater prominence in his catalogue so Opera Rara's new recording of Bellini's first opera Adelson e Salvini is most welcome. It might not be a masterpiece (anything but), yet there is the delight of teasing out the later references. The disc features Simone Alberghini as Adelson, Enea Scala as his friend Salvini, with Rodion Pogossov as Struley, Daniela Barcellona as Nelly, Maurizio Muraro as Bonifacio, David Soar as Geronio, plus Leah-Marian Jones and Kathryn Rudge, with Daniele Rustioni conducting the BBC Symphony Orchestra and Opera Rara Chorus (chorus master Eamonn Dougan). Bellini wrote the opera in 1825 for the conservatoire in Naples (rather than the bigger theatre of the opera house) and the cast were all students with men playing the roles of the women. All the women's roles were reduced, except for the heroine Nelly who was sung by 14 year old Giacinto Marras. I presume that he wasn't a counter-tenor per se but used the upper extension of his tenor voice (which was common, the tenor Giovanni David could go up to F at least). When Bellini was hoping for a revival of the work and started to revise it into two acts, the female roles went up in pitch. But he abandoned work in this and the surviving revised version seems to be a mix of Bellini and his friend Florimo. So on this disc we get the original version, with a few revised numbers in an appendix. But the female roles are all sung by women, which means that they suffer rather from the tessitura and you can't help wishing that someone could have come up with a more inventive solution! And with an orchestra fielding over 30 strings, you suspect that the recording is on a far larger scale than the performances in the small theatre of the conservatoire. The only singer who really gets to exercise their upper register is tenor Enea Scala who plays Salvini. The opera was recorded in conjunction with a concert performance at the Barbican which Ruth reviewed for this blog. The plot is barmy, with three men (Adelson, Salvini and Struley) effectively competing for the attention of Nelly. The irony is that the original French novel on which the opera was originally based (at some remove) has the sort of brooding Gothic intensity which would have appealed to the mature Bellini, but this had been mainly lost in Tottola's libretto. The opera features quite a few features that never made it to later Bellini operas. There is a considerable amount of spoken dialogue (needed to keep the barmy plot moving), and one of the characters, Bonifacio (Salvini's servant) is a comic one thus causing the opera to be billed as semi-seria. Yet there are large chunks of recognisable Bellini. He would re-use bits in later operas, including Capuletti e i Montecchi and Norma, but there is plenty that is not mature Bellini. Essentially the overall structure and feel of the music is frequently Rossinian who was after all the dominant character in Italian opera and who had been based in Naples from 1815 to 1822. Listen to the opening sequence and you could imagine yourself listening to a lesser known Rossini opera, but the slower lyrical passages and other moment such as the Adelson & Salvini duet at the beginning of Act Two show the Bellini we recognise. Enea Scalea makes a brilliant Salvini coping well with the virtuosic writing. He brings a nice elan to the more ornamental passages though the top of his voice sometimes gets a bit steely. He is well paired by Simone Alberghini's Adelson, though Alberghini does not seem quite as comfortable with the fioriture. Maurizio Muraro brings a nice comic touch to Bonifacio, including having a catalogue of his master Salvini's faults. As Struley, Rodion Pogossov does not get much to do beyond a very Rossinian aria towards the beginning of Act One, which Pogossov sings with with vibrant tones. Daniela Barcellona's Nelly has some lovely lyrical moments which she sings beautifully though there is no denying that the low tessitura makes her sound rather more mature than Bellini probably intended. Her Romanza is a finely brooding number in classic Bellini style (it found its way into Capuleti e i Montecchi) and we also hear the transposed version from Bellini's later revisions. Kathryn Rudge makes a fine Fanny, the subsidiary female character whose opening number is a lyrical love-song to Salvini (who teaches her painting). David Soar's Geronio characterful old-retainer pops up in a short duet with his master Salvini, but Leah-Marian Jones' is restricted to the ensembles. The spoken dialogue (and there is quite a bit of it) is given a good stab by the singers though it seems to have been recorded in a slightly different acoustic, and I can certainly imagine skipping over it on repeat listening. But it is good to have it there, important to present the opera as intended. The chorus's presence is mainly restricted to the finales. Daniele Rustioni and the BBC Symphony Orchestra provide sterling support. This is an important document and a testament to Bellini's burgeoning talent. It is not really a library disc, and will appeal mainly to those interested in the development of Italian opera in the early 19th century.